No degustation trip to New Orleans would be complete without at least one meal at the Garden district’s French-forward Cajun-styled bistro La Petite Grocery. It’s no wonder that this charming, honey-hued dining room with pressed-steel ceilings and nostalgic photographs from its former life has become a foodie favorite. Chef Justin Devillier makes bold choices to put a non-traditional spin on some otherwise sacrosanct dishes. The non-Louisiana-native had the temerity to re-craft a good many local favorites that have since become highly plagiarized by other toques around town. 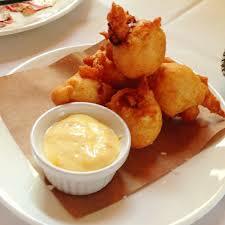 His cotton-ball sized Blue-crab Beignets with malt vinegar aioli are still the mega-hit they ever were. One bite of these soft, puffy, fried clouds of goodness, and you instantly regret agreeing to share them. More delicately portioned and therefore less sharable are the Braised Beef Short-ribs. This seemingly heavy choice for an appetizer actually started out life as an amuse bouche, but the spicy cucumber with fried peanuts keep it light and surprisingly refreshing – making it the perfect prelude to a serious second act. The local Little-neck Clams are instantly given foreign passports with a deep lime-dominant roasted red-pepper and coconut, Thai broth. 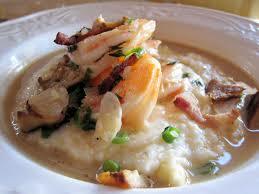 I must admit, I am always a bit surprised to see the ubiquitous Grits as an entrée option on any dinner menu, but Devillier’s Gulf Shrimp and Grits is laced with shiitake mushrooms and bacon, which go a long way to upgrade the rich and buttery cornmeal breakfast staple. The Paneéd Rabbit was perfectly tender and moist under the (somewhat meager portion of) sauce grenobloise, and the Spätzle were of the crispy variety, but there was a definite noise emanating from my plate. Turns out it was a “Rabbit and Spätzle chorus” yearning in unison for something warm, soft and creamy to combine them together! While I did try the Baked Macaroni with it’s own strong southern accent (thanks to the addition of crunchy cornmeal crumbs), I could kick myself for not trying the much-acclaimed Turtle Bolognaise. Oh well…I guess there will just have to be a next time.